Hello, hello! Hope your week is going great. Ours is good, just busy! Y’all, I have all of my days mixed up. I kept thinking yesterday was Thursday and when I went to write something on the calendar today, I wrote it down on December 2nd- yes a week ago. Is anyone feeling a bit upside down these days?! ‘Tis the season and pass the coffee! 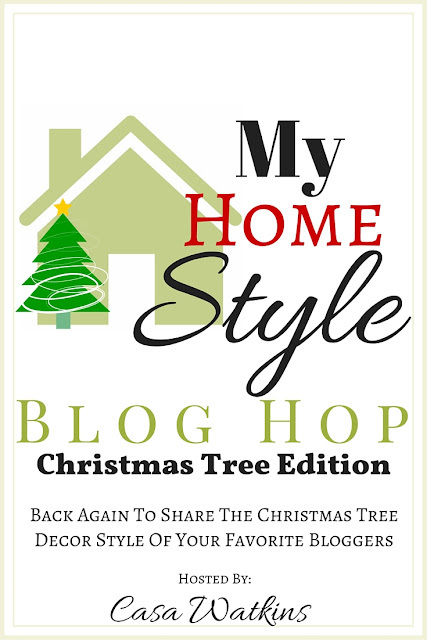 Despite my lack of ability to know what day or date it is, I am excited to share my Christmas Tree Decor Style as part of the My Home Style Christmas Tree hop hosted by Stephanie from Casa Watkins. Such a fun idea! If you’ve popped over from This Makes That– welcome! I promise I normally know what day of the week it is. Well, ok, at least I normally know what week it is. If you’ve been around here this Christmas, you already got a glimpse of the tree last week when I shared the family room. She’s a beaut! We decided to go big or go home and I was beyond excited to make her ours a week before Thanksgiving. I know, I know. That is early. (True Story: we were the FIRST customer to purchase a Christmas tree at our Home Depot this year. Literally, the first tree they sold was to us. And yes, I realize I am nuts. But I digress.) She is 9 feet tall and definitely the biggest tree we have ever had. I have named her: Classic, Preppy & Plaid. Oh there really is no place like home for the holidays and having a Christmas tree lit up in our family room really makes me happy. Especially one that is Classic, Preppy & Plaid. So, how did she get such a lovely name you ask? Well, she is loaded with a festive tartan ribbon and classic Nutcrackers. Does it get more Classic, Preppy & Plaid than that? If you’ve been following along on my Christmas Home Tour, then you know that I took a classic tartan plaid ribbon and carried it through the decor in each room. This ribbon pattern is traditional Christmas colors of red, green and blue. I seriously cannot get enough of it. Here are some shots in the foyer and throughout the house. The tree carries the tartan ribbon from the foyer and is loaded up with Nutcrackers of all sizes. I even put some full size ones throughout the tree using floral wire to secure them to the branches. Our Nutcracker collection was started by my Mother in Law years ago and I love how we are including some of the large ones in the tree this year. We also have a collection of little Nutcracker ornaments that are really happy on this Classic Preppy tree. « Holiday Home Tour Blog Hop & Home Decorators Collection Giveaway! Oh my gosh!!! This is amazing. When I saw your first picture, I KNEW I was going to love it! Way to mix those plaids — LOVE! So many beautiful colors and patterns! Love it! I am loving all of the plaid. Wow, you are a master at mixing patterns. Gorgeous tree and amazing decor!!! A girl after my own heart! Love it all… You have such a good eye for mixing patterns! Love it Heather. Love all the plaid. We used quite a bit of it this year too. Love the ribbon! Everything looks beautiful and the tree is fabulous! The nutcrackers are adorable. I love your classic and preppy tree style, Heather!! The plaid ribbon, the nutcrackers – it all fits your decor so perfectly. So fun and timeless!! Love love love this plaid! Where can I find this ribbon?!?! Heather, you amaze me with your talent for mixing patterns! I adore your Christmas tree and especially love how the nutcrackers accentuate it. Great Christmas tree and wonderful home tour. I couldn’t resist looking at it. 🙂 thanks for joining the My Home Style Blog Hop again! Love your decorations! I’m going through a plaid stage too! Got your card yesterday- those boys are way too cute! Merry Christmas sweetie. I love the way everything comes together in your space… the tree looks so beautiful alongside your drapes and the buffalo check pillows! I always love your style! I always love seeing what you do!! I spray painted dollar store nutcrackers last year too. Sharing my friend! Beautiful, bright, and festive. Great minds think alike! Thanks for stopping by!